This page features a free printable Map Of Oklahoma. 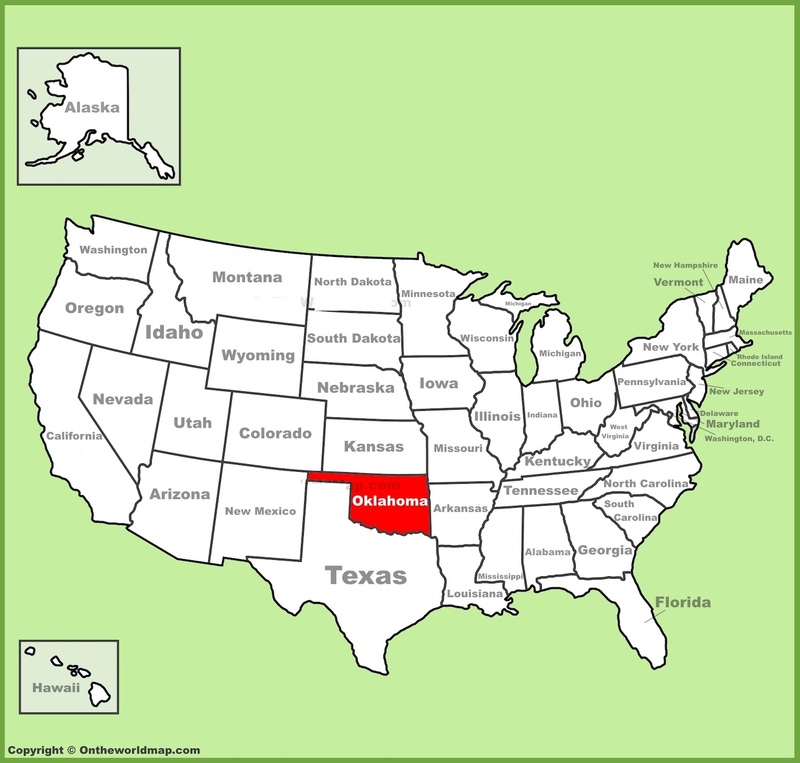 The above US map shows the location of the state of Oklahoma in relation to other US states. On November 16th of 1907, Oklahoma became the 46th of 50 states admitted to the Union. Scroll down to find fascinating facts about the state of Oklahoma. The world's first parking meter was installed in Oklahoma City on July 16th of 1935. The word "Oklahoma" is derived from two words of the Choctaw language meaning "Red People." Native American Tribes from the state of Oklahoma include Cherokee, Comanche, Kiowa, Lenape, Osage, Pawnee, and dozens more. In fact, Oklahoma has 39 federally recognized Native American tribes within its borders, and has the largest American Indian population of any state. The state of Oklahoma is the 4th largest producer of wheat in the United States. The Official State Animal of Oklahoma is the buffalo. The "Official State Meal" of Oklahoma consists of fried okra, cornbread, BBQ pork, squash, biscuits, sausage and gravy, grits, corn, strawberries (official state fruit), chicken fried steak, pecan pie, and black eyed peas. The Official State Vegetable of Oklahoma is the watermelon. Seriously. Okmulgee is home to an annual pecan festival, and holds the official world record for the largest pecan pie ever made. Jenks is a favorite town for tourists seeking retail therapy. Jenks is home to a great number of antique stores, collectibles dealers, gift stores, galleries, and other quaint and curious shopportunities. The 10 largest cities (by population) in Oklahoma are Oklahoma City (state capital), Tulsa, Norman, Broken Arrow, Lawton, Edmond, Moore, Midwest City, Enid, and Stillwater, in that order. 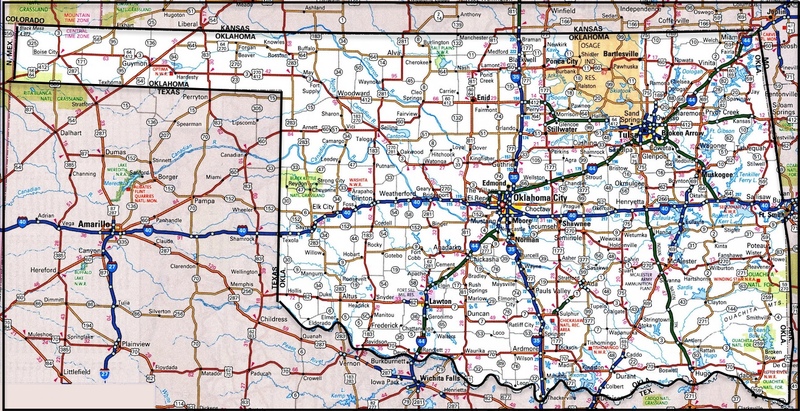 Above: A road Map Of Oklahoma.